Our Executive Suites on the Wild Atlantic Way offer style, elegance and tranquillity with a separate living area and a bespoke design boasting richly textured fabrics. 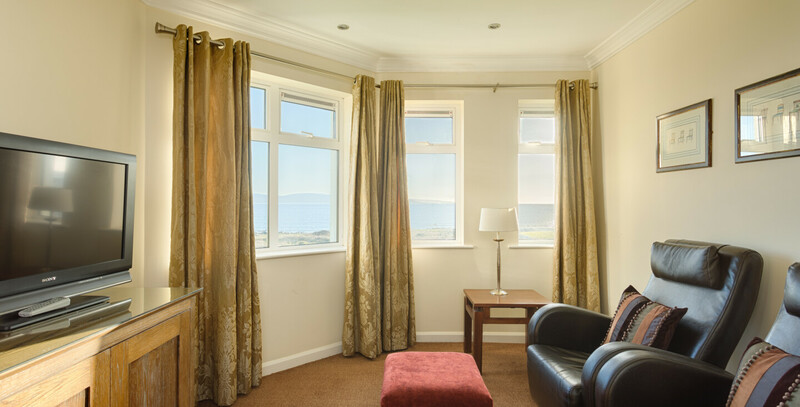 Each is designed to create a sense of well being and relaxation most offering panoramic views of Galway Bay. 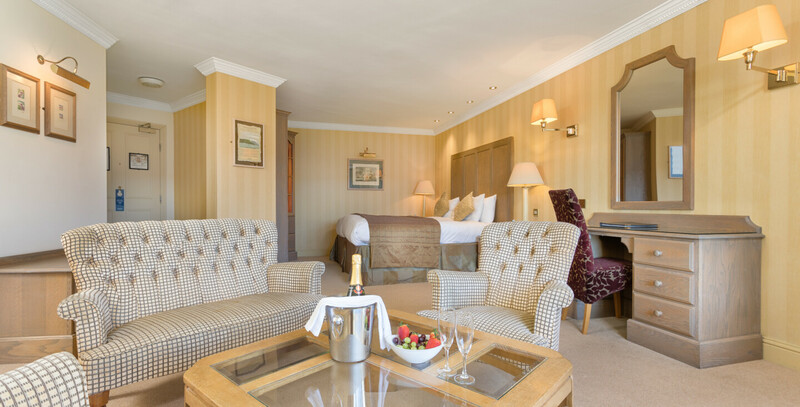 Our executive suites measure 32 square metres, offer complimentary mineral water, complimentary bathrobe and slippers, complimentary fruit and cookies, complimentary use of our outdoor hot tub and complimentary use of our leisure facilities. Traditionally styled, our beautifully appointed suites offer the extra space that can turn a great holiday into a perfect one. Featuring a large sleeping area with a King Bed and separate living room and spacious bathroom, our suites are decorated in soft muted colours. 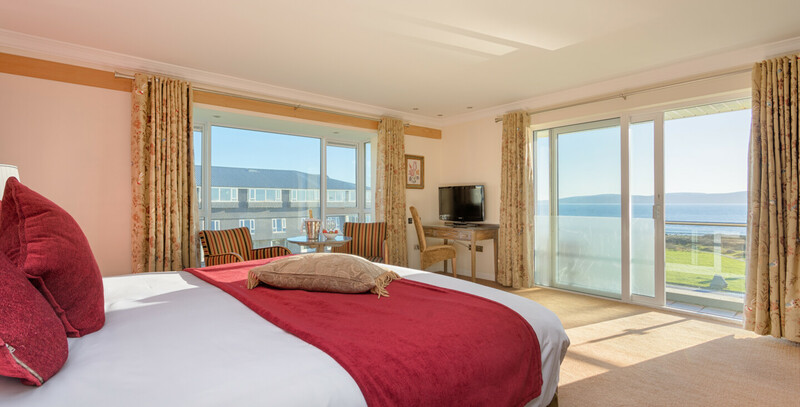 Stay with us at Connemara Coast Hotel in one of our custom designed suites and allow the serenity of our location coupled with our spectacular views, coastal walks and rugged landscape to create the perfect romantic getaway. Baineann Stíl, galántacht agus suaimhneas leis an Svuít Feidhmeannach. Tá seomra suí agat chun do dhá chois a chaith suas agus féachaint ar teilefís agus sa gcaoi nach gcuireann tú isteach ar do pháirtí agus iad fós ina gcoladh, tá doras idir an dhá sheomra. Tá chaon sheomra dearadh chun thú a chuir ar do shuaimhneas, chomh maith le radhairc leathan a thabhairt dhuit do chuan na Gaillimhe, Contae Chláir agus Oiléan Árainn. Tá an Svuít 32 méadar cearnaithe. Ins an seomra, cuirtear ar fáil uisce, róba folctha & slipéirí, chomh maith le torthaí & brioscaí úra saor in aisce. Is féidir leat úsáid a bhaint as ár ionad fóilíochta agus an tobán te atá suite taobh amuigh le radharc ghlan ar chuan na Gaillimhe. Is stíl tráidisúnta atá sna seomraí. Tá leaba mhór rí san seomra, chomh maith le seomra folcaltha agus seomra suí. Tá na seomraí dearadh le dathanna bog. Fán linn ag Óstan Chois Fharraige i ceann de na Svuít álainn deartha agus tug cead do suíomh shuaimhneach an óstán, chomh maith le na radharcanna dochreidithe, siúlóid cois sáile agus tírdhreach garbh do shós rómánsuil foirfe a chruthú! “Ba bhréa an rud a bheith ábalta an fhuinneog a oscailt ar maidin agus radharc álainn an chuan a fhéiceáil. Bhí an spás san seomra iontach. Bhí siúlóid álainn thar timpeall an óstan. Tá an staighre galánta ar fad agus an oiread spás compordach ar fud an óstan chun do dhá chois a chuir suas”.